I’m a science fiction junkie. I don’t remember the first science fiction book I ever read, but I do remember starting very young. My father gave me all his science fiction paperbacks, many bought during the 70s when he was on the road a lot for work. His collection included Heinlein, Simak, Clark, and tons of Asimov. As a teenager, I expanded that collection significantly by trading in my grandmother’s Harlequin Romance novels at the local used bookstore at increasingly outrageous exchange rates until they wouldn’t take any more. My choices often were anthologies. They had more pages and there seemed to be a ton of thick choices. I’m still a science fiction aficionado although I’ve “traded” in my paperback buying habits in favour of unabridged audiobooks and e-books. To that end, I ran across the following earlier this year and I thought I’d share: Free Science Fiction, Fantasy & Dystopian Classics on the Web: Huxley, Orwell, Asimov, Gaiman, and Beyond. This lists a variety of formats, including text and audio–alas, not for every book included. You might find it worthwhile to check out. Enjoy! As a self-confessed scifi short story junkie, the most vivid stories that have stuck with me have been short stories. 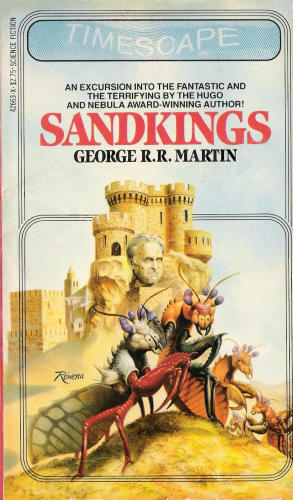 For example, Sandkings by (surprising to me!) George R. R. Martin creeped me out immensely and I didn’t see the corresponding The Outer Limits episode. You’ve heard the aphorism that people resemble their pets? This story riffs on the reverse, showing what happens when our “pets”, insectoid aliens, caricaturize us, flaws and all. I wonder how much better we’d be as people if we all had our own Sandkings putting up an incontrovertible mirror? Which science fiction stories have most stuck in your mind?